Nineteen new (or fairly new) films will screen, starting this Friday, May 6 through May 22, during the eighth edition of the PANORAMA EUROPE FILM FESTIVAL at either the Museum of the Moving Image in Queens or Bohemian National Hall in Manhattan (at the latter venue, all the films to be shown will be admission free on a first-come, first-served basis). Described in its press release, as the "essential festival of new and vital European cinema," the program begins at MoMI with an opening night presentation of the Italian film, ANNA (Per amor vostro) together with an appearance by its star, award-winning Italian actress Valeria Golino. TrustMovies has seen but three of the movies on this festival program, but all three were definitely worth a view. The opening night film, Anna, features one of Ms Golino's finest performances (in a list of near-non-stop triumphs: see her IMDB profile), Even in throw-away movies, she almost always shines, Here, she plays a married woman -- with three near-grown children (one of whom is deaf and mute) and a criminal hubby who seems to be taking the family into dangerous waters -- and so she is, not surprisingly, having what looks like something close to a major breakdown, We see Anna from many angles: at work, at home with the family, with her former and now unemployed boss (another terrific performance from Gomorrah's Salvatore Cantalupo), and as she perhaps embarks on an affair with the lead actor on the series in which she works as "prompter." Golino is an extraordinary actress (and a good director, too: remember Miele? ), and her fine performance anchors this movie. Its writer and director, Giuseppe M. Gaudino, has chosen to film mostly in black-and-white when "reality" seems more present. Color is used for flashback and fantasy, and for art and symbolism, of which there is quite a bit. (Billowing dark clouds threaten our heroine, growing ever larger as the movie rolls along and her mind appears to totter.) And while the film occasionally threatens to go over the top, Ms Golino keeps it mostly grounded. So compelling, however, is the build-up of negativity surrounding Anna that I am not at all sure I buy Gaudino's idea of a feel-good finale. Still, for fans of the actress, Anna is a must, and for anyone unfamiliar with Golino's work, it's not a bad place to begin. Also in the fest is a movie I covered when it opened in New York last year: Summer of Sangaile (shown above). If you missed its very limited theatrical debut, you should catch it here at MoMI because it is one of the most visually spectacular films of last year. (It was also the Best Foreign Language submission from Lithuania, though it did not make the shortlist.) You can learn more about the movie and/or read my earlier review in full by clicking here. The third of the films I've managed to see is the "period" serial-killer movie MARSHLAND (La isla mínima, shown above and below), the DVD of which I happened to have rented recently from Netflix. Set in 1980 -- not so long after the fall of the Franco regime, when the political and social life of life of Spain felt anything but secure and stable -- the movie has a distinct noirish feel as two mismatched detectives investigate the disappearance of a young girl in a small town in the Spanish provinces. Starring one of my favorite Spanish actors, Raúl Arévalo (above), together with Javier Gutiérrez, the movie holds a dark mirror up to the face of Spain at that time, and we see everything from greed and corruption to typically macho male values, along with the nasty face of religion, politics and patriarchy, as the women involved go down one by one by one. 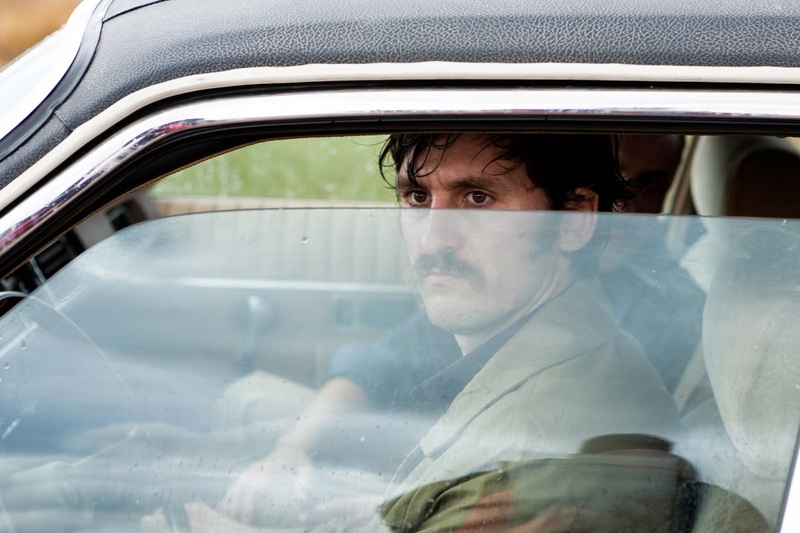 As co-written and directed by Alberto Rodríguez, Marshland may take no prizes in the realm of thrillers and serial killers, but its unusual combination of dark nostalgia coupled to smart social critique makes it a stand-out of sorts. 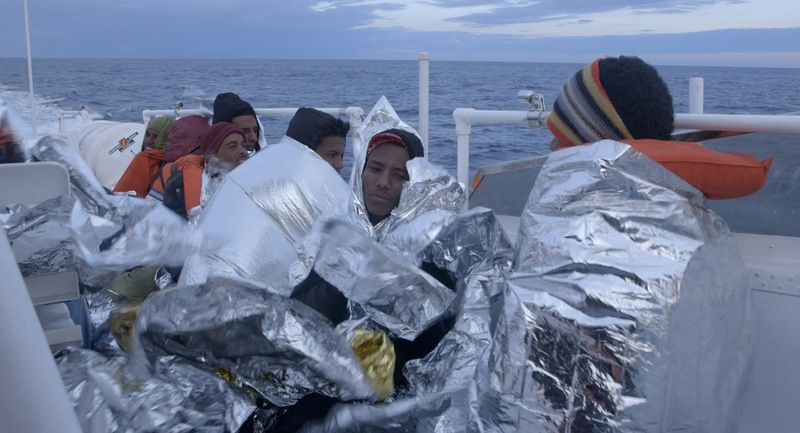 The still above is from the documentary Lampedusa in Winter, one of several very well-received documentaries also included in the festival. You can view the entire 19-film schedule and/or purchase tickets by clicking here and then clicking on the film(s) in which you're interested. Museum of the Moving Image is located at 36-01 35 Avenue (at 37 Street), Astoria, NY 11106. Bohemian National Hall can be found at 321 East 73rd Street (between 1st and 2nd Ave), New York, NY 10021. Note that tickets for Panorama Europe at the Bohemian National Hall are free, with seating is on a first-come, first-served basis.